Very nice! :) Really makes you think. And is kind of scary, too! Oh, thank you for this. Has made my morning! You love so hard! Like a momma should. I think that's what amazes me the most about my kids: that everything my husband and I are teaching them, they will then in turn pass on to their own kids, leaving a trail behind them. I just hope we're good enough teachers. Someone told me shortly after our oldest was born, that raising a child is like watching yourself grow up. You can see bit and pieces of yourself in their laughter, their smiles and even in their laugh lines by their eyes. It's comforting somehow. I have always found that painting moving. With that poem it is breathtaking. What a wonderful legacy...our children! That picture hung in my nursery as a baby and then it had an honorable place in my girls' nursery. Beautiful, Empress and so straight to the heart. Perfect! I put off nursing school so I could RAISE my children..then i got pregnant again...BUT it WAS so worth it. That is great! I have felt like my kids have been my life's work and I wouldn't trade that job for anything. That is beautiful as is the picture...but is that kid abnormally large?? We have a little book of art with Mothers and their children on one page and quotes on the other. I think I have seen this beautiful ensemble in there and cried many a time. That is exactly how I feel as a mother. I am living that painting right now. Thanks for sharing this. It's so beautiful. I love it. *sigh* it really is pretty amazing to be a mama, isn't it? you capture that...perfectly! Sigh this was a much needed read today...like a giant fuzzy warm hug...knowing that times I may lose sight of something so wonderful that I created. He's perfect. My best piece yet. It's lovely and perfectly said, Alexandra. I can't think of anything harder than mothering, because it is lifelong and so personal (you can't separate yourself, your past or your emotions) and really the only major "job" that comes without any training whatsoever. My mother once said to us that she felt she had failed at so many things in her life but...her one achievement was us. I was in my 20s at the time and it stunned me to know that she had felt like that. Of course, as a mother now I can understand where she was coming from. I feel I have had minor achievements here and there in life (school or work) but nothing compares to my son. When I see his eyes widen with curiosity or see how sweet and caring he is to his friends, I feel validation that I am doing something right. ahhh. A little bit of poetry and art infused into my day. Lovely. Some days I think I have to remember that my kids can't be the sum total of my achievements, that I have to stay my own person and do other stuff. Then some days I think christ, they're awesome -- if I never do anything else of any worth the world should STILL kiss my goddamned feet. absolutely beautiful, from one momma to another. Beautiful- and so perfect for the end of a very long day. Beautiful poem. And very true. Absolutely beautiful. Words like this help put everything else into perspective. You totally did this for me - I know it! Just lovely. And it's true. We are Picassos! Monets! Even Manets! Just look at our pieces of pint-sized perfection. Such a lovely poem, and yet how easy it is to lose that perspective. Thank you for the reminder just minutes before my girls get up. Perfect timing! A very moving poem. Thanks for the reminder. They are the best thing we can give the world! What a beautiful poem. I think this touches many a mother's heart. AWwwwwww. Totally love this post. And that painting is beautiful. We had it in my house growing up. 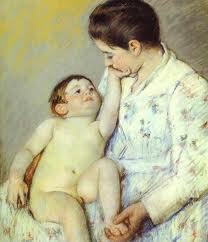 I have a set of notecards of Mary Cassat. Her paintngs are beautiful, and so is this poem. Thank you for the reminder. Love this - I have no other words. It made me happy and sad at the same time. I am late to this party, but love it all the same my friend....thanks for sharing.